DALLAS, December 2nd, 2013 – A new poll claims that only 6% of Americans approve of Congress’s job performance. The poll covered only a handful of likely voters, 10% of which were Democrats, 7% of Republicans and 3% of independents. 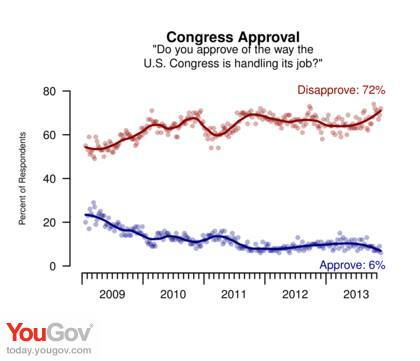 But other polls confirm the steadily declining approval for America’s lawmaking body. Whether citing the government shutdown, budget woes, the soaring national debt, civil liberties concerns and or the healthcare reform disaster, Americans are fed up. According to Rasmussen, 78% of Americans want to fire Congress and start over with new, though 47% believe that neither party represents the American people. A series of November surveys show Democrats lost the 9-point lead over Republicans after the 16-day government shutdown. The country’s sour opinion of congress and aversion to the unpopular healthcare reform law poses a threat to re-election, a fear President Barack Obama acknowledged. As a result, Democrats have already begun distancing themselves from Obama. The same poll shows Republicans leading Democrats on the generic ballot by a slim 2% margin, but trends from other polls indicate Americans are disillusioned with liberal leadership. Obama’s approval ratings also bend to record lows. As of today, the Rasmussen Reports showed 54% of likely U.S. voters disapprove of President Obama’s job performance. These levels are the lowest of his presidency. 46% of polled Americans believe Obama knowingly lied when reassuring Americans they could keep their health insurance plans and 56% expect healthcare to be worse under Obamacare’s administration. 53% believe the Obama administration is incompetent.